Now Karen's powerful father calls on Pike (a former cop) and his partner, Elvis Cole, to keep an eye on the LAPD as they search for his daughter's killer--because in the luminous City of Angels, everyone has secrets, and even the mighty blue have something to hide. But what starts as a little procedural hand-holding turns into a deadly game of cat-and-mouse. For a dark web of conspiracy threatens to destroy Pike and Cole's twelve-year friendship—if not their lives. And L.A. just might be singing their dirge. 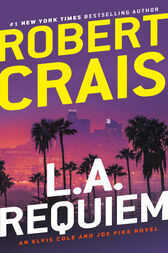 Robert Crais has written for such award-winning television shows as L.A. Law and Hill Street Blues. His novels Free Fall and The Monkey's Raincoat were nominated for the Edgar Award. He lives in Los Angeles.